On bright winter evenings (see also this post, this post, and this post) I often go down to the sea-front at Aberystwyth with the aim of photographing the starlings which roost under the pier . It’s been almost three years since I’ve come back with any worthwhile results, though. For that long, as far as I know, the starlings had done nothing remotely like the spectacular pre-roost displays which they are renowned for. At first there was a fairly acceptable theory circulating amongst the photographers and birders. The birds would be too busy simply surviving during mid-winter to spend valuable time and energy tearing around over the town at dusk. The fact that their most spectacular displays in recent years had been during the longer days of early March tended to support this idea. It was thought that the displays might be part of a process culminating in their exodus later in the month towards their breeding grounds further north. The presence of a predator (like a peregrine) was believed to precipitate avoidance behaviour which looked sensational to us but was actually self-preservation for the starlings. But last winter – nothing. And until last Saturday – nothing this winter either. All very frustrating and it wasn’t just me that was disillusioned either. It wasn’t the greatest of evenings last Saturday and I almost stayed at home. On arrival at the wooden jetty I found the usual gaggle of photographers and sightseers. 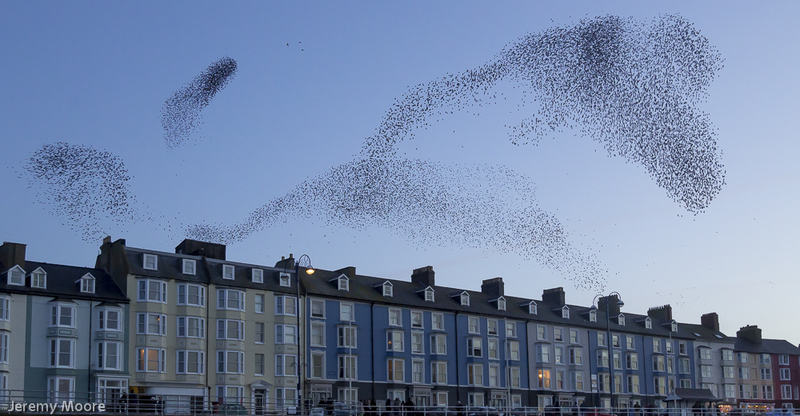 I met a fellow photographer and began to gossip about this and that and bemoan the lack of starling activity. The birds seemed to be following their usual routine. The earliest arrivals flew around silently together for a while before diving down amongst the framework of the pier and starting to chatter. Subsequent arrivals presumably heard them chattering and followed them in in a fairly disorganised fashion. I was on the point of leaving when the birds deserted the roost and began circling around over the town. There followed a spectacular exhibition of flight lasting more than ten minutes, flocks rapidly splitting and re-grouping, forming three-dimensional ribbons, ovals and swirls which constantly morphed into each other. It was exhilarating to see it after so long; I expect the word “wow” might have been heard and a broad grin seen. About eight minutes past five the display was over. I shook hands with Si and we went our separate ways. I had loaded my gear back into the nearby van when I noticed that some of the birds had left the pier and were again swirling around. By this time it was far too dark to think about using the camera but I wandered back over to enjoy a short encore. Back on the prom I met another friend who had watched the display from a distance. We agreed how lucky we were to live at Aberystwyth and be able to see such an awe-inspiring exhibition. “It’s a gift.” she said, “I don’t usually believe in that hippy bollox but this is an exception”. Speaking as the photographer who is never quite satisfied, though, I’ll add that it was a shame they were displaying over the town rather than the pier itself. The birds’ backdrop was a darker section of the post-sunset sky than it would otherwise have been. This necessitated a step-by-step increase in the ISO rating and opening up of the aperture. 3200 ISO and f4 seemed a bit dodgy to me………. Back home, though, I found that the images are noisy at 100% but I have some usable results even at those settings. In the days of film such images would have been virtually unobtainable. This entry was posted in Uncategorized and tagged aberystywth, bird photography, display, murmuration, Nature Photography, starling, starlings. Bookmark the permalink. Quite spectacular! Nicely captured Jerry, I would most definitely be wearing a broad grin had I been there! Maybe another reason I should go to Leighton Moss before the season ends. I may get lucky, you never know.. I was at L.M. just after New Year and they had no starlings at all. But of course things might have changed since then. Thanks for the comment, by the way. It all happens so fast you just have to press the shutter and hope!